Last year I wrote about a bill introduced in Maine's legislature that would effectively block towns from building their own municipal high speed data networks, even when -- as is often the case in rural Maine -- existing providers have refused to do so for them. The bill, modeled on one created by the American Legislative Exchange Council that has become law in 17 other states and introduced by that group's state co-chair, was ultimately and unanimously defeated in committee. Now a bill has been introduced in Congress to prohibit states from passing such legislation. 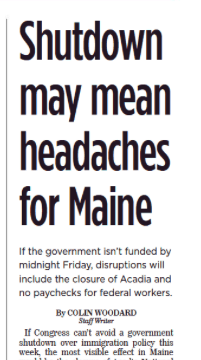 I report in today's Portland Press Herald about why its been introduced, what ALEC thinks of it, and how one of its co-sponsors, Rep. Chellie Pingree, D-ME01, has to say about the bill and its prospects in Congress. Talking American Nations with KBUR's "Heartland Politics"
Recently had a conversation with Monmouth College political science professor Robin Johnson about America's regional cultures and their implications for the Midwest generally and the 2016 election results in the Upper Mississippi Valley in particular. Our talk aired on this week's edition of Johnson's program "Heartland Politics" on KBUR in Burlington, Iowa, right in the heart of what I've called Trump Democrat country and with a broadcast area encompassing a swath of eastern Illinois (where Monmouth is located) and parts of northeastern Missouri. You can hear it again Tuesday morning at 0930 Central Time or right here online. For more on voting patterns in the 2016 election, see this piece and this one. Earlier this month, Satoshi Ukai, the New York bureau chief of the Japanese daily Asahi Shimbun was kind enough to come to my home here in Maine for an interview on American Nations, which is now available in Japanese. I enjoyed speaking with him and appreciate his newspaper's interest. 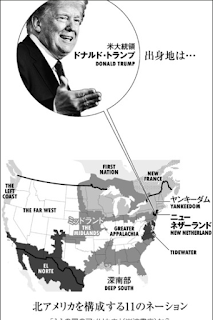 For those of you who read Japanese, his interview appeared in the January 24 edition. Online subscribers can find it here. The paper also ran this book review back in January 14. Even from here, I can tell Asahi Shimbun has a print circulation of 7 million. Friends there tell me volume one of Iwanami Shoten's beautiful two volume hardcover translation has sold out everywhere, and even the English edition of the book hit #18 overall on Amazon.jp, which is pretty amazing. In any case, I hope the book gets back into stock and that readers there find it useful. And thanks again to Mr. Ukai and his colleagues for their interest. American Nations is also available in Korean and is forthcoming in Chinese on the mainland. In today's Portland Press Herald, I wrote about how Maine Governor Paul LePage's nomination of Mark Dubois, the public face of Nestle Waters (dba Poland Springs), to the state Board of Environmental Protection is drawing fire. Dubois, whose firm has been on the scene for some amazing conflict of interest situations in the past, goes before a legislative confirmation hearing later today in Augusta. The disastrous year for the North Atlantic right whale, the world's second most endangered mammal after the species' Pacific cousin, doesn't appear to be abating. After seventeen of the whales have been found dead since June in New England and Atlantic Canada -- more than three percent of the total worldwide population of 450 -- scientists warned the species will be extinct in another 23 years if something doesn't change. But the most recent news only increases anxiety about the whales: a series of speeding violations by ships in a zone of the Gulf of St. Lawrence set up by Canada to protect the whales and, separately, an absence of calf sightings on the whales calving grounds off Georgia and northeastern Florida. I have the full story on these and other developments in the whales' odyssey in this week's Maine Sunday Telegram. I reported last summer for the Press Herald about the right whale die off, with some additional background about the species and how its been monitored. I've reported on the species on and off for a decade for other publications, context you can find by starting here. At this writing, the US government is within hours of its first shutdown since 2013. As President Trump and Congressional leaders try to come up with an agreement, Mainers may want to know how a partial government closure is likely to effect them. I put together a piece on just that for yesterday's Portland Press Herald. Have a look while you're waiting for the news from Washington. This month, when the Trump administration unveiled its plan to open virtually all areas of U.S. federal waters to oil and gas exploration, most of New England's elected leaders expressed outrage. Every member of the US Senate and US House from the five coastal New England states signed onto a bipartisan bill to ban drilling in the region, while every governor from Massachusetts to Florida announced their intention to seek an exemption. Florida's governor even got one. The one exception: Maine's Gov. Paul LePage, who not only didn't join the chorus, he'd written a letter in August asking Interior Secretary Ryan Zinke to do just what he did. 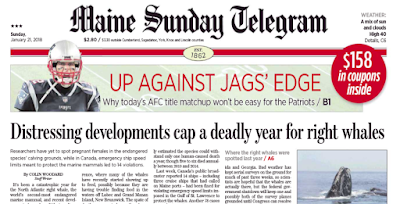 In this week's Maine Sunday Telegram I report on the controversy and how LePage's stance on drilling may complicate Maine's effort to get a Florida-like exemption. I previously reported on oil and gas drilling in our region in late 2015, when Canada leased areas on their side of the border, at the entrance to the Gulf of Maine. The struggle over transparency at President Trump's voter fraud commission continues even after its demise. 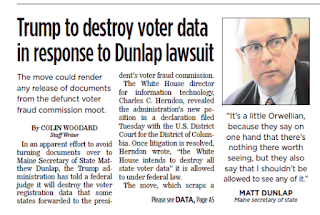 In yesterday's Portland Press Herald, I updated the ongoing drama between the White House and Maine Secretary of State Matthew Dunlap, one of four Democrats on the 11 member commission, who said he was frozen out of its deliberations for months and in November sued to gain access to working papers, past, present and future. Trump pulled the plug on the commission Jan. 3, apparently on account of Dunlap's lawsuit, and Justice Department lawyers then informed Dunlap that, despite a court order, they would not be immediately turning over the documents. Dunlap then asked the court, in effect, to enforce its order, especially as the White House had said they were turning the voter registration data collected by the commission -- and its alleged "preliminary findings" -- to the Department of Homeland Security, which would continue the voter fraud work. Only now that plan has been dumped. This past week, the administration has instead announced it intends to erase all the voter registration data it collected, thereby removing one of the reasons Dunlap had argued he should be allowed to see its working papers. Dunlap told me it was "Orwellian." President Trump this week pulled the plug on his controversial voter fraud commission, but the drama surrounding it has only escalated. Trump's decision came on the heels of a federal judge's ruling that the commission had to turn over working documents to all of its commissioners, including Maine Secretary of State Matthew Dunlap, who had filed suit to obtain them after he and the three other Democrats on the body were cut out of the information flow. But, as I report in today's Maine Sunday Telegram, the Trump administration is now saying it will not comply with the judge's order on the grounds that, since the commission does not now exist, Dunlap is no longer a commissioner and not entitled to see its documents. Normally mild mannered Dunlap responded with outrage, saying the Department of Justice was showing contempt for the law and American values. 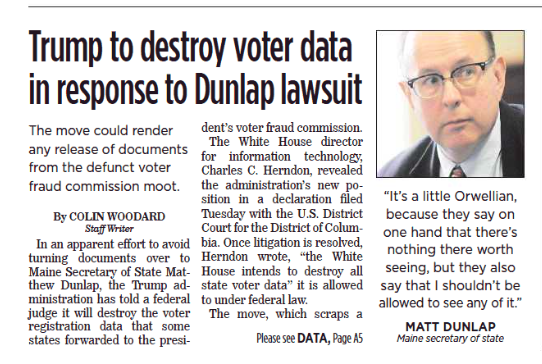 Today's story also describes how Dunlap's insistence on transparency may have caused the president to shut the commission down, and also what may or may not happen if the voter fraud effort is passed to the Homeland Security Department. For more on the voter fraud commission, start here.